A man who killed the partner he brought to England "in the hope and promise of a new life" has been jailed for life for her murder. 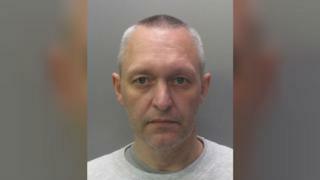 The body of Lithuanian national Dzilva Butiene, 48, was discovered in the flat she shared with Kestutis Bauzys in Wisbech on 5 April. The court heard how Ms Butiene died after Bauzys, 46, stamped on her, crushing her liver against her spine. Bauzys had denied the crime but was sentenced at Cambridge Crown Court. Sentencing him, Judge David Farrell ordered him to serve a minimum of 17-and-a-half years. The judge said Bauzys was becoming "frustrated" by the drinking of Ms Butiene, whom he had brought to England from Lithuania in 2013, and that this was "aggravated" by his own drinking. The court heard that Ms Butiene had more than 60 bruises and marks on her chest and abdomen. Mitigating, Jeremy Benson said that "we will perhaps never know why [the attack] happened", in the flat in Debenham Court, Orange Grove, Wisbech. Police described the murder as "a horrendous case of domestic abuse behind closed doors". In a statement, the victim's mother said it was a "horrible irony" that Ms Butiene, a mother of two sons, had been due to return to Lithuania four days later to receive treatment for her alcoholism.